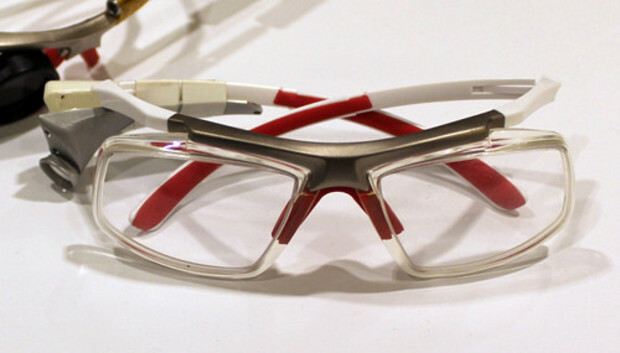 It's impossible to judge the value of a product that's still in the prototype stage, but if nothing else, the GlassUp augmented-reality smartglasses promise to address two problems with Google Glass: They make a slightly less nerdy fashion statement, and they place overlaid content closer to the center of your sight line, theoretically mitigating eyestrain. I welcome both of these features. I don't feel comfortable wearing Google Glass in public (except inside geek-friendly venues like CES 2014), and I have definitely experienced eyestrain during concentrated use of Google Glass, which places its content overlay in the upper-right periphery of your vision. GlassUp is an Indiegogo project that's being developed by a small Italian firm, and we can definitely see some European design flare in the company's non-functional mock-up. At last year's CES, GlassUp simply handed out brochures. This year, they returned with two pieces of hardware. A design treatment showed what the shipping product will look like, while a very, very, very rough engineering sample showed a faint sliver of AR content in one's line of sight. Francesco Giartosio, GlassUp's CEO, told me he's going for a simple, sober, streamlined approach to augmented-reality eyewear. Unlike Google Glass, the specs won't overwhelm you with a motherlode of content or even full-color images, he says. Instead, monochrome content is to fed to you as simple strings of text--text messages, email headers, sports scores--in a comfortable, easy-to-comprehend UI. Notifications from accompanying iOS and Android apps route through Bluetooth to a single projection unit, and battery life is rated for 150 hours of stand-by, and eight hours of "normal" usage. About 100 to 200 hand-made units will go out to early crowd-funding backers this spring, and GlassUp estimates a final price of $400 when retail units ship in July. I'm in the Google Glass Explorers program. I used the Epson Moverio specs and other smartglasses at this year's CES. And I don't think any of these smartglasses are ready for a mainstream, non-techy, consumer audience. But I do think GlassUp is on to something with its streamlined, much-less-than-the-kitchen-sink approach. Keep smartglasses simple. Make them look like real glasses. Use them as rudimentary, hands-free adjuncts to our smartphones. Less is more.